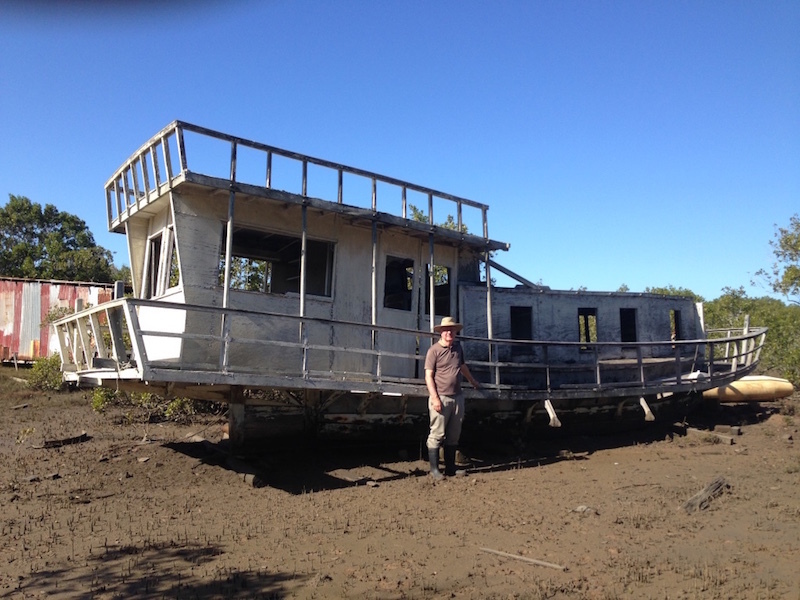 In the course of my Moreton Bay researches I have often wondered why so may wooden boats – once the love of someone’s life – lie abandoned and left to rot amongst the mangroves. Last weekend, I revisited one such ‘cemetery’ at Rusters in Redland Bay. It was a former boatyard that I used to frequent in the early 1990s to visit and interview bay identity Eric Reye who had made his home there on his boat ‘Coolooloa’. 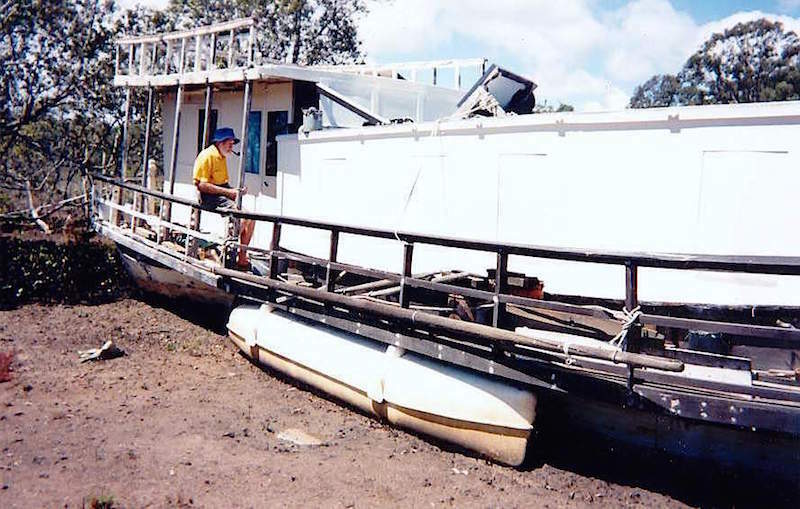 Eric spent years converting the old surf landing dory that he purchased after WW2 into a floating laboratory for further research into biting midges (he was a world leader in that field then). Although he never fulfilled his dream, ‘Coolooloa’ did provide him with a home, and with an interest in trying to make the old craft seaworthy. Like a true sailor, he loved his boat – it was his ‘other woman’. And I think this is why so many boats are left to rot: their owners just couldn’t bear to part with them, so that eventually when they died their boats were left to fade away, forgotten widows, in the mangroves. Interested to learn that some of “Coolooloa” still remains and that there are other rotting boats there. Has anything been done with Rick’s land? After Ricky Watts passed away,Ted, the Watts family sold the property to an Asian family, who as far as I am aware, are still the owners. I approached the boatyard by tinny. It would be impossible by road now, but the house still seems to be intact. Thanks Peter. 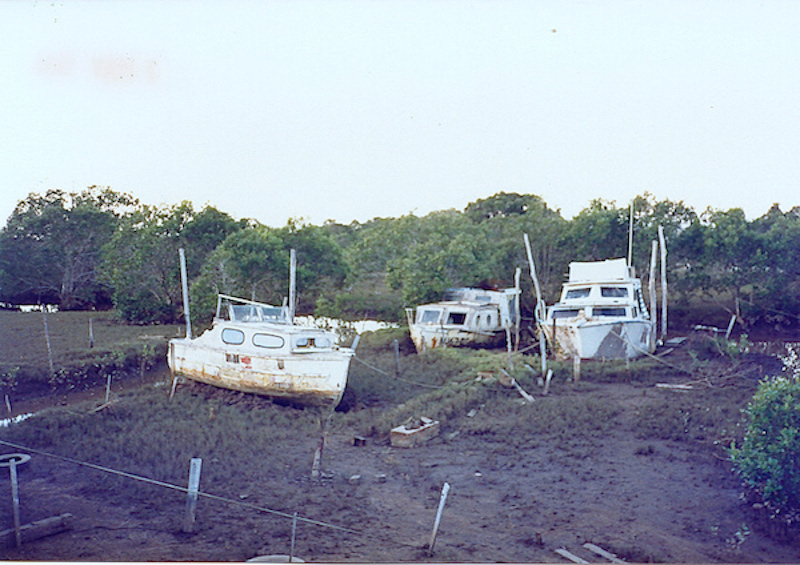 As we “sailed” through Moreton Bay we often saw old boats that seemed to be just left to die. I always thought there were some stories there! If only those rotting hulks could talk, Nancy! I think that the advent of fibreglass hulls would have diminished the number of abandoned boats (and stories) around the bay. I helped a mate rescue an old wreck beached in the Broadwater at Southport. Structually, she was sound, but had a hooped keel. When I tried to tow her north, she insisted on heading NE, eventually coming up level. I think he sold her off to a liveaboard. Never did find out her name. I have a 1910 photo of a wreck or abandoned vessel at Steiglitz with ‘Russian Prince’ roughly painted on its side. I can`t find any record of that name in my lists. Anyone know of it? Although the Walrus officially operated only until 1873, she presumably operated without a license for many more years, because, according to westender/com.au/local-rum-reborn/, Jimmy Wall, 17 July 2013, she had run aground on a riverbank on the Albert River in 1884. She was found by farmers Davy and Gooding, who discovered that the distillery pot was still in good condition, said a quick prayer for James “The Bosun” Stewart, took the distillery pot, applied for a license and founded the Beenleigh Rum Distillery. Stewart was never heard of again. There are no corresponding wrecks on the upper Albert River, but in 1887, a 14 meter flood would have washed the wreck off the sandbank and downstream to Tippler’s Passage, where the lower portion of the Walrus possibly came to rest, to be re-named “HMS Russian Prince”” by local kids who played on what was left of her. The upper outer planks would have been knocked off in the floodwaters. Compare the 1870 photo of the SS Walrus with the 1910 photo and you can see the strong beams which once supported the stern “paddle”. The dimensions of both ships appear to match perfectly, as does the location with the effect of the 1887 flood and the last known location on the Albert River.